The huge quantities of data that companies and governments store in their computer networks have long attracted the attention of bad actors. In order to protect data holders and deter cyber criminals, governments must use legislative, investigative, and enforcement tools. This section examines cybercrime laws, as well as rules relating to investigation and enforcement. 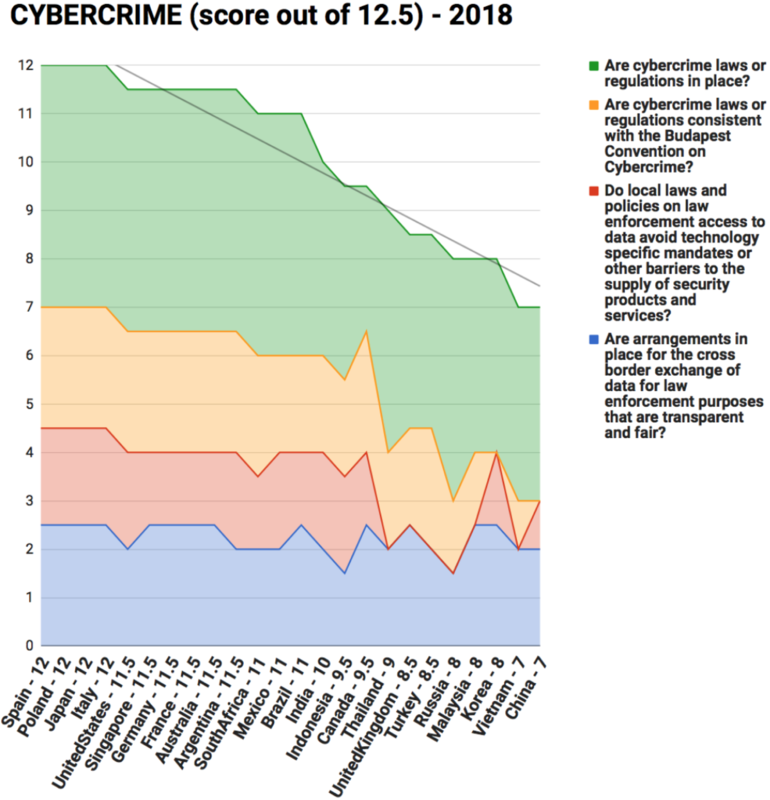 Overall, the Scorecard finds that most countries are rising to the challenge of creating legal regimes to protect data from cyberattack and physical security breaches. Most countries studied have legislation to combat the unauthorized access of data stored in the cloud. Most also have implemented cybercrime laws, many of which are compatible with the Convention on Cybercrime. Italy, Japan, Poland, and Spain all score very highly in this section of the Scorecard. Unfortunately, a few key jurisdictions still have gaps and inconsistencies in their cybercrime laws. China and Vietnam score poorly in this section of the Scorecard. The Scorecard also asks whether local laws and policies on access to data by law enforcement authorities avoid technology specific mandates (e.g., requirements for specific tools that allow access to encrypted data). These mandates may act as a barrier to the supply of security products and services. There was a wide divergence on this issue and on other issues related to the investigation and prosecution of cybercrime.